The field of pharmacogenomics — using a patient’s genome to predict how well they will respond to medication — is a hot area of medicine today. But, almost all data used in these predictions comes from people of European decent. Minoli Perera, PharmD, PhD, wants to change that. She is a pioneer in the area of pharmacogenomics in African-Americans and has some new discoveries to share. "Our genomics are based in Africa, and we're really all African in our cores. And to really know about genomics, is really to know about the genomics of Africa." Principal Investigator for ACCOuNT (the African-American Cardiovascular Pharmacogenetics Consortium). 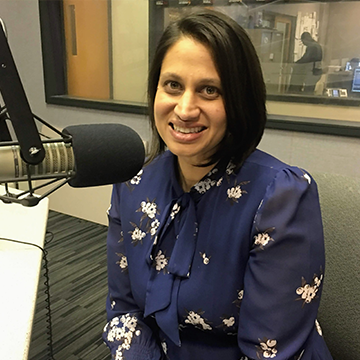 Africans are the oldest population on earth and that means people with African ancestry have more genetic variation than other ancestries, says Minoli Perera, PharmD, PhD. Yet, 96 percent of all genome-wide studies are in people of European ancestry. Minoli Perera: "If you always look at European populations, you're only looking at a small subset of that variation in the genome. There's a bigger landscape to see in the African genome. I describe it a little bit like a bowl full of jelly beans ... as we left Africa, each one of these little groups that left just kind of took a handful of those colorful jelly beans. So they have some of the things we find in Africa, but it's never the full compendium of jelly beans. It's always a subset. As we went to Europe and Asia, we added our own colors into it, if you keep the analogy of jelly beans, but it was never what will you can find in Africa. And that's the problem is that we continue to look at Europeans but there's all the unique genetic variants in African-Americans that will never discover in European populations." Only looking at a small subset of the population can also create problems with the predicitive tests we use to detect genetic predispositions. In a recent Northwestern Medicine study, published in the Journal of the American Medical Association, Perera and her team discovered a group of gene mutations seen only in African-Americans and people of African-Americansancestry that may contribute to an increased risk of serious bleeding while taking warfarin, a common anticoagulant drug. Read more about the study, which was published in JAMA. Minoli Perera, PharmD, PhD, has nothing to disclose. Erin Spain: This is Breakthroughs, a podcast from Northwestern University, Feinberg School of Medicine. I'm Erin Spain, executive editor of the Breakthroughs Newsletter. The field of pharmacogenomics, using a patient's genome to predict how they will respond to a medication, is a hot area of medicine today, but almost all data used in these predictions comes from people of European descent. Dr. Minoli Perera wants to change that. She's an associate professor in the Department of Pharmacology here at Feinberg and a pioneer and the area of pharmacogenomics in African Americans. She's here today to talk about her recent discoveries. Thanks for joining me today. Minoli Perera: Thanks. It's really great to be here. Erin Spain: So let's start by talking about your background a little bit. You are a pharmacist, you have a PhD in pharmaceutics, and you decided to pursue a career in academia. Why did you want to go this route? Minoli Perera: I think when you start out in science, you go in one direction, and you think you know what you're going to do, and when I finished my PhD I was really well trained in pharmacology, specifically well trained in drug design and then I realized that I did not want to work for a pharmaceutical company. That I really love the freedom of academics, the ability to pursue my own thoughts and ideas and directions, and so I decided I needed to learn something new. And actually that I had no background in genomics after I finished my PhD, so I spent about two years learning genomics in a postdoctoral fellowship and really fell in love with that piece. And then doing pharmacogenomics is kind of a way to marry my two sides of my life, my clinical knowledge of drugs and pharmacology with this kind of new found love for genomics. Erin Spain: So as you said, you're not an MD, you don't see patients, but you've said in the past that helping patients is the most important part of what you do. Tell me about that philosophy. Minoli Perera: Sure. I think when you think about basic science, you think about people you know, working with cells or rats, and those are all very important pieces, but I was first trained as a pharmacist, so as a PharmD you think about the drugs are about to give to somebody, the interactions they could have things that could happen because they have another disease on board and how that affects the medications they're taking. So when I started doing pharmacogenomics, I saw it through the lens of what are problems that physicians and clinicians of all kinds face that are unpredictable? Meaning they're going to have to guess, they're going to have to try and figure out what's going on and they're going to use trial and error to figure it out. And if I could use genomics to help predict that, then it's patient focused, it's answering a specific problem that we currently face today, and so when I think about medications, doses, adverse events, I try and find those in which we don't have an easy way to figure it out. And that's kind of what I mean by patient focused thinking about when we're interacting, when clinicians are working with patients, how can we make that interaction better, less trial and error. Erin Spain: And this has to do a little bit with precision medicine as well. The promise of precision medicine is using genetics to treat disease. And I want to ask you, this is an area that you've been looking into quite a bit. How does our ancestry play a role in precision medicine? Minoli Perera: Yeah, it's such a great question and it's part of the reason actually I fell in love with genomics. It's the story of us actually as human beings. So, humans arose on the continent of Africa and we actually lived in Africa for our large portion of our existence on Earth and it was only relatively recently, in you know, geological time periods that we left Africa and inhabited the rest of the planet. And in doing so, you know, we lived, our genomics were really shaped by Africa. So when I started in pharmacogenomics, this was so fascinating to me. The idea that, you know, our genomics are based in Africa and we're really all African in our cores and to understand, to really know what we're know about genomics is really to know about the genomics of Africa. Erin Spain: That is fascinating, you know, but yet nearly all of the Genome Wide Association studies in the world have been of people of European descent. Now this is problematic for people of other ancestries, especially the African ancestry that people that are mostly African ancestry. Why is that? Minoli Perera: That's right. So African Americans are actually mixed between African ancestry and European ancestry, with most of their genome coming from Africa. And what that means is, because I said we arose in Africa we came to become humans in Africa, Africans or the oldest population on earth and that means that they have the most genetic variation. So, when you study people of African ancestry, like African Americans, they're going to have more changes in their genome than people of European ancestry. And the problem comes up that is, if you always look at European populations, you're only looking at kind of a small subset of that variation in the genome. There's a bigger, like a bigger landscape to see in the African genome. I describe it a little bit like a bowl full of jelly beans, if you think of that is all the genetic variation in our genome, which are, is also part of our evolution, right? That's what makes us adapt and, and all kinds of good things. As we left Africa, each one of these little groups that left just kinda took a handful of those colorful jelly beans. So they have some of the things we find in Africa, but it's never the full compendium of jelly beans. Minoli Perera: It's always a subset. And you know, as we went to Europe and Asia, we added her own colors into it, if you keep the analogy of jelly beans. but it was never what will you can find in Africa. And that's the problem, is that we continue to look at Europeans and there's all there are unique genetic variants in African Americans that will never discover in European populations. Erin Spain: And you say we keep looking at the Europeans actually is a 96 percent of these genomic wide studies are European descent. Erin Spain: And you're making this part of your mission as a scientist to make African-american genomic medicine a reality. But what are some of the challenges you faced to get this population to collect their data and get them into these studies? Minoli Perera: You know, the biggest problem, I think people asked me that question, I think they, or maybe they assume that I'm going to say recruiting patients. Recruiting patients is difficult regardless of the group they belong to. So of course that's difficult, but that's always going to be difficult. I say finding other people who I can collaborate with and who are also collecting African Americans. In genomic research, I always say you, when you find something interesting, you can't ever do it once. You actually have to do it twice in two independent sets and finding that independent set for me is sometimes nearly impossible because when you call other investigators looking at these incredibly interesting questions and pharmacogenomics, they say, "oh, we have thousands of samples" and then you ask them the killer question, which is how many are African American? And they say something like, "oh," and there's not many. Not very many. And honestly that's the hardest part for us is finding those other groups of investigators doing that. Now that's not to say there aren't very dedicated scientists also doing exactly what I'm doing. It's just not as many as you would like. Erin Spain: And there's health ramifications for this population because of this. Minoli Perera: Absolutely. So, you know, we know a lot about the genomes of Europeans. In one of my earlier papers we talked about a clotting disease where we actually have clinically available genetic test where if you're somebody who's had a lot of these, like deep vein leg clots, maybe a physician would suspect that you have a genetic predisposition and he could order right now a genetic test for you. And what I don't think physicians think about is these two tests, one is called a Factor V Leiden, the other is a prothrombin genetic variant. They're extremely rare in African Americans, but African Americans suffer from clotting in deep veins at a higher, a much higher, proportion than Europeans. So, as an example, Serena Williams recently talked about that she had deep vein thrombosis, multiple, um, and she's one of the best trained athletes in the world and probably sees the best doctors in the world. But if they were to do that genetic test on her, it would come back as normal, what we think of it as negative, but it does not mean she does not carry genetic variants that are from her African background that would predispose her to that. Erin Spain: So that test is based off of your people of European descent. Erin Spain: One topic and drug in particular you've been studying African Americans, is Warfarin, also known as Coumadin, which helps prevent clots from forming in the blood. So you noticed a concerning trend in many African American patients on Warfarin and clotting and general, um, in this population. Tell me about that and how that led to your recent publication in JAMA. Minoli Perera: Um, so when we had been studying Warfarin for quite awhile and we had a large cohort of African Americans that we had lots of deep clinical data and one of the questions early, early on was should we collect bleeding data? And when we were doing this, we'd see a few people who would have bleeding events. This is a known adverse event to a drug like Warfarin. Warfarin is an anticoagulant. It is what people would think of is thinning your blood. So obviously bleeding would be a complication from that. So when we went back into the medical record for these patients, we saw that they were bleeding, within the therapeutic range for this drug, meaning that they weren't taking too much of the drug, which is what you would expect for them to bleed. So many of them were within the range or just slightly above the range. It made us realize that this may be a range in which physicians don't have a high clinical suspicion of a bleed. If we found genetic predictors to help us tell us which patients may bleed that range, that would be really important information for a physician. Erin Spain: So that's where you got started with this study and you, um, started looking at the genes of this population. What did you find? Minoli Perera: So we had the original group of African Americans, these were older cohort we had collected through the years and we found a significant genetic variant in a gene nearby, a gene called EPHA7. I'd never heard of this gene prior to that. So then we went back and collected a second cohort. As I said, you always have to have the second cohort and no one had data like this in blacks. So we actually had to collect it ourselves in the second group of patients and we were able to replicate the signal. So this gave us more confidence that this may be a true genetic finding. We went on to kind of try and figure out what this gene does, what happens if you carry the genetic variant a close to this gene. And we saw that if you had the genetic variant, so we did this in an in vitro cell culture, you increase the expression of EPHA7, and that's everything that's in the JAMA paper is, is the explanation for that. Now, I think the big question is what does that mean? And I think that's a much more complicated question. EPHA7 has never been implicated in bleeding in adverse events of any kind. It's actually been more known and kind of the neural development sphere, we know that it's expressed in the endothelial cells. These are the cells that line our blood vessels. So perhaps it's acting there. Uh, there's some very old publications around EPHA7 seven and its interaction with EPHA4 and Ephrin. These are two other things found in the endothelial lining of our blood vessels. That may mean a destabilizes clots. So one theory may be that if you carry too much EPHA7 you stopped this clot stabilization. So you're on the drug, you have a little tear in one of your vessels, a clot forms, but it can't be stabilized and hence you bleed. One important thing I did forget to say about the people who bled in our study, these weren't just minor bleeds. So when you're on the drug, you could have nosebleeds or you know, bruising. These were people that required hospitalization. So these are serious consequences. Erin Spain: So now that you have a paper like this out in the world, have you heard from other scientists who are interested in exploring what does this mean? Minoli Perera: Absolutely. People actually working in EPHA, this is a whole group of proteins, are very interested because it's kind of a new phenotype for them that's outside of the neural realm. So I think an unraveling that mystery is going to be a lot harder. We don't even know where the gene really acts on the blood system, so we first have to figure that out. What tissue is relevant for this change in EPHA7?And once we figured that out, there's a little bit of an added complication because most studies of how genes and proteins work are in a normal setting, meaning not under drug treatment. You know, one hypothesis we have is lots of people may carry this variant. It's not particularly rare for African Americans. So if you're African American you could carry it and live a completely normal life. Erin Spain: It's only if you're on this drug. Erin Spain: Something about that combination. Minoli Perera: Exactly. It's kind of like, you're standing at the edge of the cliff and then the drug just pushes you right over, right? So you might be perfectly fine until you're on the drug. Erin Spain: Studies like this really do lay that groundwork though for future genetic tests that could be given. Minoli Perera: That's right. That's always the dream. You know, that's always the dream of what we do, is that what we will do will translate into a task that can be used for patients. I think a lot more work has to be done on this finding. It's very preliminary. Um, you know, we had very small numbers of bleeds, bleeding in general and this drug serious bleeds are a rare adverse event so it's not like we had a huge number of patients bleeding. But you know, it'd be interesting to see prospectively if we could measure the genotype, you know, get the phenotype of patients and see if we divided them into two groups and we're maybe more vigilant monitoring exactly. Would we save some of the patients from bleeding versus the ones we just went on to care for know the standard of care. Erin Spain: There are other projects you're working on, one that a lot of people find pretty fascinating. It has to do with drug metabolizing enzymes and the livers of African Americans. What have you found in this area? Minoli Perera: This is not a new study, but an ongoing study in our lab and it actually ties in my previous work and life in pharmacology. So in pharmacology we love thinking about how fast drugs leave our body. This is a way for us to tell how quickly we metabolize, tells us if we're going to have adverse events like be toxic on the medication. And early when I was first learning about genomics, I knew that there was a very important enzyme called CYP3A4. It's a drug metabolizing enzyme that metabolizes 60 percent of the drugs currently on the market. Erin Spain: Okay, it's an important one. Minoli Perera: It's an important one, and it's part of a gene family and one of the members of this gene family that also metabolizes all the same drugs. Um, there's a genetic variant in Europeans, that means they have no functioning enzyme and a majority of Europeans carry that. However, for African ancestry people, a majority of them carry a functioning enzyme and we're still trying to figure it out carrying a function again. So, um, does that change how fast you metabolize things are not. And maybe it does for some drugs and maybe not others. And so I wanted to kind of a catalog all the differences that may exist on the background of African ancestry, between let's say, how fast these drugs are metabolized, the novel genetic variants that may drive those changes and also to uncover how these very important enzymes are regulated. So our body closely regulates gene expression and that's one of the goals of this study, but all of it done on the background of an African genome. Erin Spain: Can you just dive a little deeper into that study? You've said it's ongoing, so you've published some papers about this. Where are you at right now? What can we expect next? Minoli Perera: So we are actually, we're in the process of getting the first paper published there's actually three more that are finished and about to be submitted. So we're right at the cusp of actually a lot of them coming out. One of the first things we had to do was develop statistical methods, which is not always the most interesting thing, but around using these more complex genomes that are in African ancestry individuals. Um, and then one of the newest pieces, I think the next paper that will be come out is we did a very simple, actually, it was shocking to me nobody had done it yet. Um, people, uh, that are African American vary in how much of their genome is African. So African American is a social construct. We label ourselves a certain race and other people label us, but genomically, um, that's not how we see it. So as an example, you could be 90 percent African, I'm think of yourself as African American or you could be Barack Obama and be 50 percent African and still identify that, identify that way. And so this variability, how much Africanness you have in your genome, does that affect anything? So we looked at just gene expression in the liver. The live is important for diseases, lots of blood sorts of proteins are made in the liver and drug metabolism. And we said do any of these very with how African you are? And we found things that absolutely do. Erin Spain: So this paper is going to be coming out soon. Minoli Perera: Yes, I hope so. Erin Spain: All right, well we're going to be looking forward to those results. It sounds like you said no one's looked at this before, but you have some results. Minoli Perera: We do. We do. They're very interesting. Erin Spain: We're going to keep those under wraps for now. So you're the PI on a $7.5 million grant that's really laying the groundwork on continued investment and growth and minority pharmacogenomics. Tell me about this grant and the consortium that you are leading. Minoli Perera: Yeah, this was a really amazing opportunity and we're funded by the National Institute for Minority Health and Health Disparities. The consortium, which is named ACCOuNT, was built around some of our preliminary, our first findings in pharmacogenomics for African Americans. And what I realized when I did that study, is we were one of the first people doing these kind of trying to do these large scale pharmacogenomics studies and if we were ever going to make this a reality, we had to do a whole lot more, a whole lot faster. So we got a group of scientists, some of them in Chicago, some of them in DC, and they're all participating, they're recruiting patients. Right now we're looking at cardiovascular medications and we're doing first the discovery work because these have never been, we've never searched the African genome, to know what's predictive for lots of drugs we know have genetic predictors and Europeans. So in some ways it's reinventing the wheel, but for African Americans. And then we have a second very large project which is delivering this information to the physician in a form that is easily understandable. So this is with a collaborator of mine at University of Chicago, Peter O'Donnell, MD. So he's created the system in which a physician can understand the results from a widespread genetic test. So testing lots of different variants in a person, but they need to know just one piece of information. Does this change how Iwhat I'm going to prescribe for this patient or how I'm going to treat this patient? So we try and give them a highly digestible pieces and now he and I have incorporated the things that we find in African Americans so that when you see an African American patient you will have information that's relevant to them. And so both of these are really research based. If we give this information to the physician, will they change what they're doing, Are there new things to find with you know, drugs we've already studied in Europeans and that's just the science. So another very important piece to me was the dissemination of this information you previously said, you know, most studies in genomics or done in European populations as an NIH funded, any NIH- funded institution or I'm investigator, must make their data public. If you go to these public databases, there are almost universally European descent. There's now a larger contributions from Asian ancestry individuals but not very many African Americans. So we have decided to build a platform that's going to integrate the genomics, the clinical data. We also collect the transcriptome, which is the mRNA level in the blood of these patients in an integrated way, but that is protective to the subjects that participate. And we hope by giving people all this data free, freely available, other people will make their own discoveries. You know, we are going to ask our questions and they're important, but lots of people have questions and I, and if I want more partners, I have to have data out there for them to use. Erin Spain: How many individuals have you been able to bring into this consortium? How many different genomes do you have right now? Minoli Perera: So we are currently recruiting at the University of Chicago, at UIC, at Northwester, at the VA in D.C. As well as George Washington University. I want to say we're probably in the 300 to 400, for patients that we've recruited and we're collecting DNA, we're collecting their transcriptome, as I said, their blood mRNA and a levels. As a another part of this actually, which is a, you know, very novel area of science is pluripotent stem cells. So we're actually collecting that too. We don't have any funding to convert these into all the different tissues you can make that into. However, as is no surprise, maybe to you now, there aren't a pluripotent stem cell banks that have African Americans. So we're, once you create the different tissues you can with those stem cells, will the expression levels be different because they're on the background of an African ancestry person, you know, that's what we hope to answer in the next round, you know, the next thing, big thing we'll do, but we're collecting all the data and importantly the people that are giving us this pluripotent stem cells have clinical phenotypes, clinical information that comes with it. We also have a group of a core that thinks about community engagement. Erin Spain: I was going to ask about that because you said it's hard in any study to recruit people, but you must be doing something a little differently with where you're going with the community engagement aspect to recruit African Americans. Minoli Perera: We get a lot of input from our community advisory board that tells us, you know, if the materials we're providing, the language we're using is the, is a culturally appropriate way to approach patients. We have expanded to pilot projects. Many of these pilot projects are actually about educating communities, African American communities, whether that's church based, whether that's physician groups, African American physician groups, um, African American patient groups about the importance of participating in this type of research. We hope that that benefits certainly our projects, but larger projects like the, All of Us project that is now recruiting across many of the places I just mentioned. The other part, and I tell this actually to my recruiters will many, many eons ago I used to recruit my own patients and I realized that how you connect to somebody who may be different, of aa different group than yourself, is to tell them the, the passion, the reason you're doing this. And so when I used to approach my patients, I would tell them I want to find something that will be predictive for African Americans. My goal is to make it predictive for African Americans. If I find something that's helpful to other people, that's great. I mean, that's always good, but that's not my goal. My goal is for this community. And I think that resonates with people because they realize I'm not just adding African American's into my study to kind of, you know, add some diversity, some flavor, you know, my goal is not that my goal is very specific and focused. Erin Spain: Well, I can tell that you are passionate about this and you know, be on advancing the science. Social Justice does play a role in what you do. What inspires that side of your work? Minoli Perera: Um, I tell the story from kind of early on when I was first giving talks about some of the things I did and most of my audience are our physicians or scientists and I would give this talk and I'd have physicians come up to me after the talk and I always assumed it would be a question like, I have an African American patient with this problem or that problem. And that was never the story I got. I would have African American physicians come up to me and they'd say, my aunt just died from a, you know, an, a warfarin related bleed. My mother is on Warfarin and we can't get it to be stable. This was so personal and I realized when I'm giving this talk, that's what they're thinking about. Of course they're thinking about their patients as well, but this is such a personal piece. They their physicians and they can't even help the people in their family and they would say, I'm really happy about you doing this, I really hope you find something that's important. And it was humbling, it's humbling to me when patients say, you know, yes, I'm happy to join your study because there's a large amount of trust and giving somebody your DNA and the first people I think at every talk are the patients that participate in my studies. Erin Spain: Thank you so much for being here today. Minoli Perera: Thanks, it was really pleasure. Erin Spain: People can learn more about your research by going to our website, news.Feinberg.northwestern.edu. I'm Erin Spain. Thanks for listening.